What can you do when your dog develops a case of food envy and won't eat his kibble? Give him what he wants, within moderation, by making some changes to his regular diet and helping him regain his appetite. Is It a Case of Food Envy? I have a nine-year-old Golden and an eleven-year-old Border Collie. Last week we watched a three-month-old Cockapoo for a friend. The dogs all tolerated each other well enough, and of course the puppy had way more energy than my two, but no problems there. The problem now is that my Golden won't eat his food. He did eat some of the puppy's food while he was here, so would this make him not eat his own food now that the puppy is gone? I think that your older dog really liked the taste of the puppy kibble, and now he's holding out for more. Puppy formulas usually contain a higher percentage of protein which usually makes them tastier. Adult and senior dog food formulas include a lower percentage of protein and fat to help guard against obesity. There are a couple of things you can do to persuade your dog to eat normally again. You could add a bit of boiled ground beef to his kibble to spice it up a bit. You'll gradually be able to reduce the amount of beef until he's eating his food again. 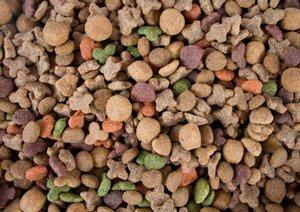 You could also buy a bag of the puppy kibble and mix a small amount in with his regular kibble. Follow the same method as with the ground beef, gradually reducing the puppy kibble until your dog is fully back on his regular diet. All things considered, you should also continue to observe your dog's behavior. There's always a possibility that he's not feeling well right now, and he may eventually need to see your vet if his condition changes for the worse. Thanks for your question, and I hope that this is just a simple case of food envy.